Heat waffle maker on medium-high setting. Heat 10-inch nonstick skillet over medium heat. Divide beef into 8 portions; shape each into thin patty. If desired, season with seasoned salt and black pepper. Place 4 patties in heated skillet; cook 5 minutes on each side. Transfer cooked patties to plate. Repeat with remaining 4 patties. While patties are cooking, separate dough into 8 biscuits; split each into 2 layers. Place 1 layer of dough in hot waffle maker. Close lid; cook 2 to 3 minutes or until golden brown. Repeat with remaining layers of dough. 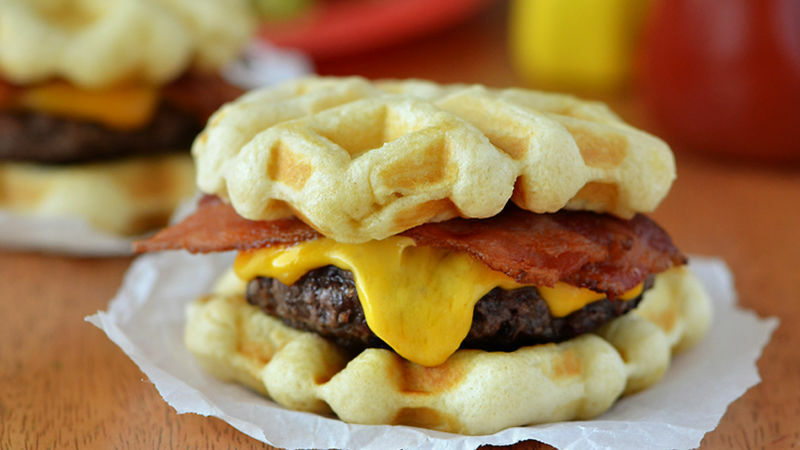 To serve, place each patty on 1 baked biscuit waffle. Top each patty with 1 slice of cheese and 1 halved bacon slice. Cover with remaining baked biscuit waffles. Add lettuce, tomato and onion for deluxe bacon cheeseburgers! For a milder, nuttier flavor, use Swiss cheese instead of Cheddar. Don't need 8 burgers? Use the 5-pack of biscuits instead. You'll need 1 1/4 pounds beef, 5 slices of cheese and 5 slices of bacon.